April is the month to start your succession plantings of beets, lettuce and carrots every 2 weeks. These small succession plantings let you have a steady supply of vegetables fresh for the table all season. Early in April is a good time to harden off your cabbages, broccoli and other brassicas started in March; then transplant them by mid-month. They thrive with compost, a good organic mulch, and row cover against the frost. Hill your early potatoes when plants are eight inches high, and again two weeks later. Watch out for potato beetles – handpick. Don’t forget to buy more seed potatoes for a second June planting, while you can. Store them in a cool dark place until you are ready to plant them. This late planting often yields less than your tradition St Patrick’s Day planting, but they will store better for winter eating. When the weather is warm enough (soil temp is over 65°) then sow corn and transplant a few early tomatoes such as Glacier or Stupice under row cover. 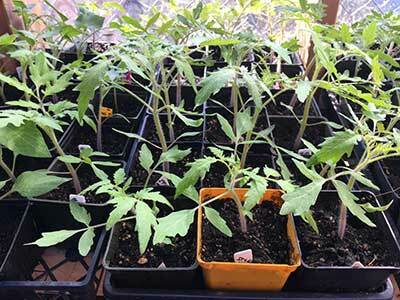 There is still time to start more tomatoes from seed. You can also start watermelons, cucumber, and cantaloupe in soil blocks or paper pots to get a jump on the warm weather crops. We are still eating sweet potatoes from last summer’s crop. They are really an amazing crop that can be stored at room temperature for almost a year. So don’t forget to order some slips now so you will have them in time for planting when May rolls around. We start our slips in the greenhouse from the best of last year’s crop. We grow a dozen varieties, from All Purple to white-fleshed O’Henry, Sweet dry white fleshed red skinned Japanese Red, and traditional orange-fleshed Beauregard or Bush Porto Rico. I love them all. If you haven’t grown sweet potatoes before, Southern Exposure’s Sweet Potato Growing guide will tell you how. Harvest greens, enjoy abundant salad greens, savor asparagus, and prepare to weed. I may never be able to say enough good things about mulch. It protects soil from erosion, adds nutrients, and so much more. Despite the growing interest in no-till gardening and permaculture, some people are still hesitant to use wood chips as mulch in their garden. They may not break down as quickly as other mulches but wood chips still have many benefits. One of the best things about wood chips is that you can often find them for free and you can be fairly certain that they’re free of chemicals, trash, and weed seeds. To locate free wood chips ask your town or city for the company that trims roadsides and power-lines. These companies are often looking for ways to get rid of the excess of wood chips they create. Sometimes if you live near where they’re cutting they’ll even deliver it to your yard for free. Alternatively, check with local landscaping companies and arborists as well as garden supply and feed stores. While colored bark mulches are usually pricey they may offer plain wood chips for a decent price. For anyone unfamiliar, “nitrogen tie-up” is when the nitrogen in your soil is being used by microorganisms to break down carbon material (like wood chips) making it unavailable to plants for a time. However this doesn’t make wood chips bad, remember plants need carbon too! Some farmers also see other benefits of “nitrogen tie-up” like the fact that the nitrogen doesn’t leach out of the soil or too far down for plants to reach. If it seems like your wood chips are taking too long to break down or you’re seeing signs of nitrogen deficiency you can add amendments to boost your nitrogen levels and help your wood chips break down. Grass clippings, seaweed, chicken manure, and soy meal are all great options depending on where you live and what you have available. Wood chips do an excellent job at helping to keep your soils evenly moist. Many people know that they help keep your soil from drying out which is very important in dry climates or for those without access to irrigation. However, fewer people are aware that wood chips can help with soggy soils too. Wood chips help absorb excess moisture and are a great way to add organic matter to heavy clay soils. Also worth noting is how a thick layer of wood chips can help suppress weeds and unlike black plastic, it will fully break down leaving you without clean up and a smaller environmental impact. Two important features in organic gardens are fungus and beneficial insects. Wood chips are an excellent way to encourage both of these. Many of the types of fungus in your garden that help break down organic material into usable nutrients for plants will thrive with the addition of wood chips. Some people, like awesome folks of Edible Acres, actually grow edible mushrooms like wine caps on the wood chips in their garden! 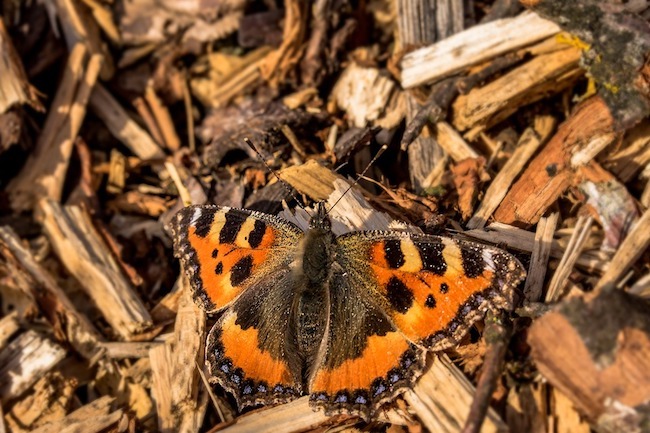 Several insects like earthworms and predatory beetles also enjoy habitat created by wood chips. Earthworms like the moist soil and will feed on the wood chips as they break down and predatory beetles will use them as shelter as they feed on the harmful pests that attack garden plants. If you’re looking to add mulch to your garden this year consider wood chips. In most areas of the east coast, they’re readily available and can help you create healthier soils and a more productive garden. For many tomatoes are the highlight of the summer garden. The refreshing sweet yet acidic flavor of a garden tomato is world’s away from the bland, mealy supermarket tomatoes of winter. Unfortunately for those living in areas with hot, humid summers getting a good tomato harvest can be a struggle. Many times tomatoes can become afflicted with fungal diseases like Verticillium wilt, Fusarium wilt, or Alternaria. Alternaria also known as early blight causes “bullseye” leaf spots and can causes lesions on the fruit. Fusarium wilt causes the plant’s leaves to wilt and turn yellow and then brown. It usually begins on the plants lower leaves. Like Fusarium wilt, Verticillium wilt begins at the bottom of the plant causes yellow spots to form on the leaves before the leaves turn fully yellow or brown. There are also many other tomato afflictions you could be experiencing in your garden these are just a few common ones. Don’t handle your tomatoes when they’re wet. Fungal diseases are passed through moisture. Avoid working with your tomato plants until after all the dew or rain had dried off. Using drip irrigation is more efficient and can help limit the spread of fungal diseases because the water is going directly to the plants’ roots. For those with small gardens, it’s also possible to spot water the base of the plant. If you must use overhead watering water in the early morning so that the plant will have time to dry off during the day. Prune, trellis, and weed around your plants. We all start each spring with the best intentions but often the summer gets away from us. It can be easy to fail to keep up with these important tasks when our garden is competing for our attention with work and family obligations. However, maintaining good airflow around your plants is vital to preventing fungal diseases. 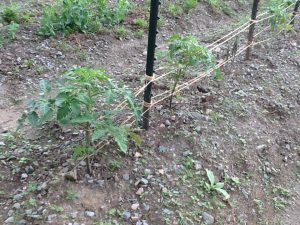 Tomatoes can be trellised in a variety of manners like the “Florida weave” pictured above, on cattle panels, or some sort of homemade tomato cage. Many fungal diseases that afflict tomatoes live in the soil. To keep your tomatoes disease free you must rotate your crops. 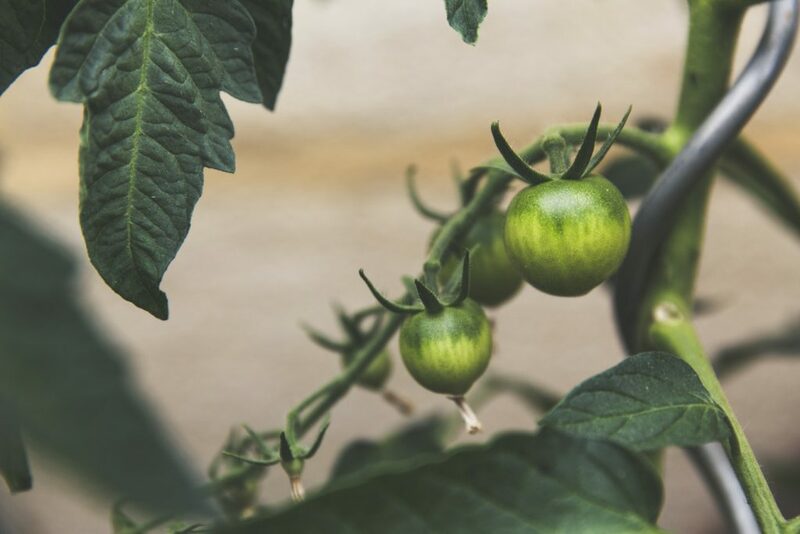 Don’t plant tomatoes or other nightshades (including potatoes, peppers, and eggplants) in the same space multiple years in a row. You should use a minimum of a four-year rotation. Keep your soil and plants healthy. Along with rotating your crops, you should also work hard to improve your soil’s health which will help you grow healthier, less vulnerable plants. Get your soil tested and add amendments as needed. Practice no-till agriculture. Use cover crops and good quality compost to add fertility and organic matter to your soil. Mulch pathways and around plants to add organic matter and habitat for beneficial fungi and microbes. Some varieties have been specifically bred to better tolerate these diseases. Check out our disease resistant selection. If all else fail you can find organic fungicides. Look for those that are OMRI (Organic Materials Review Institute) listed. Keep in mind that organic doesn’t always mean completely harm-free. Many fungicides will kill off your soils’ good fungus as well as the bad. Some fungicides like copper can even cause toxicity in your soil if used too frequently or in high quantities! Some gardeners have luck with products like Mycostop which are created from bacteria that feeds on the fungus. Having tomato diseases ruin your harvest can take a lot of the fun out of gardening. 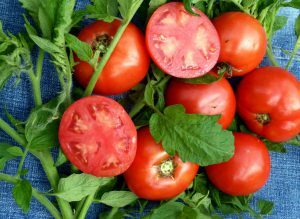 Try following these tips to keep your tomatoes disease free this year.